“My horse has not been himself lately”. “My horse has lost a lot of weight”. “He seems to be flinching when I groom him”. Tick bites on horses are more common that one would expect. Often the symptoms of equine Lyme disease are ambiguous and in several of those cases, there are no other presenting clinical signs. 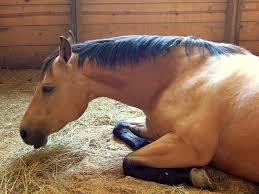 In some horses, there may be long term effects of chronic Lyme disease as well. Let us study the prognosis of Lyme disease in horses as well as the treatment and some tips for prevention. Neurological symptoms of Lyme disease in horses-Increase sensitivity to stimuli, swollen joints, neck stiffness, head tilt, behavioral changes and depression. Equine Lyme disease or borreliosis can only be confirmed through a blood test. However, things are not as straightforward as one would expect. The equine Lyme disease test may come positive only after 3 months of the infestation which means that many horses actually test negative for Lyme antibodies in the early stages of the infection. Also, horses that do test positive but are treated with antibiotics continue to show positive in the test-thereby complicating interpretation of the resolution of the disease. The causes of Lyme disease in horses are the same as those in humans: the Borrelia burgdorferi – a spirally twisted bacterium transmitted most commonly by deer ticks found in New England. The ticks themselves pick up the bacteria while going through their different life cycle stages and during feeding on mice or rodents. If the infected adult tick then feeds on a horse next, the chances of that horse acquiring Lyme disease significantly increase. As in case of other animals, Lyme disease in horses must be treated with antibiotics. Tetracycline and doxycycline for horses with Lyme generally show good results in the initial stages. IV treatment works better than oral therapy but that usually means that the horse has to be admitted to the clinic. To avoid this expensive option, most vets prescribe oral doxycycline. If symptoms recur or the horse does not respond to oral medicines, then IV tetracycline may be the next step. An anti-inflammatory medicine may also be recommended to ease discomfort. Currently, there is no approved vaccine to prevent Lyme in horses. However, some off-label dog tick vaccines have shown favorable results in protecting ponies from Lyme disease. A lot of research is still needed on this. Also the cost of transporting or gaining approval for such a vaccine, if it is made, could be phenomenal. The best you can do for your horse is protect it from tick bites. The prevention of tick bites and quick removal of attached ticks can reduce chances of tick associated diseases and especially long term effects of Lyme disease in horses. Check the horse regularly for ticks while grooming. Groom the horse thoroughly daily, and in particular, inspect its mane, tail and the area under the ears. Certain species of ticks are very small and often go unnoticed. However, regular grooming and cleaning can help prevent and minimize ticks. Clean or fence off pasture areas having increased risk of tick exposure. Make the horse’s habitat unfavorable for ticks. Clean the area well and trim the grass. Avoid having brushes and overhanging structures that make it easy for ticks to hide. If you ensure trimming the leaves of tall trees and are fastidious about mowing the grass, you will have fewer ticks to worry about. Treat the horse using vet-approved tick or fly repellent products. Most of these are permethrin based and they help repel ticks from attaching to horses and also deter flies. Use tick products in spring, summer as well as autumn as this is the time when ticks are rampant. If a tick is attached to the horse, remove it using tweezers. Firmly grasp the tick from just below its head and pull it upwards and outwards ensuring that all of its mouthparts come out. This will prevent infection. Lyme disease in horses can present itself as many things and it also has long term effects like lameness, lethargy and muscle wasting. There are a few equine Lyme disease prevention vaccines on the horizon but until then horse owners just need to be extra vigilant and ensure protecting their horses.